Larry, Jimmy Gourd, Jerry Gourd, and Junior. Image source. Recently, I've been watching VeggieTales movies, livetweeting them, and gathering the tweets into blog posts (with help from Storify). I've been really enjoying this- there's so much childhood nostalgia for me, and the songs and jokes are just THE BEST. But we all know why I'm really doing it. It's because I'm an ex-evangelical and I have Some Opinions about the morality lessons Christians teach to children. Opinions which I will sum up here. Basically, I wish that instead of being taught absolute rules about "you should be X" or "you shouldn't do X", they gave us the tools to evaluate each situation and make a good decision for that specific situation. Instead of "don't be scared," I wish they talked about how to recognize whether you're in actual danger or you're just overreacting, how to decide on appropriate actions to take to keep yourself safe, and how to calm down when you're feeling anxiety that's disproportionate to the actual badness of the situation. Instead of "you should forgive", how about giving guidelines on deciding when to forgive someone and when to just cut them out of your life, and how to establish boundaries with someone that you can't trust anymore. Instead of "don't lie", how about a discussion of the motivations one might have for hiding the truth, and when those motivations may or may not be morally justifiable. Instead of "obedience", they should talk about in what situations you should obey an authority figure (yes, that includes god) and when you shouldn't. Instead of "be thankful", how about advice on managing your desires and dealing with them in a healthy way- and that includes the fact that there's nothing wrong with wanting new things and buying things for yourself. Instead of "don't be selfish", how about teaching some principles to help us decide when to put others first and when to put ourselves first. Instead of "don't spread rumors", they should give guidelines on what kind of information is appropriate to share about another person, and what things you shouldn't repeat. Advice about how to evaluate a situation, about what factors might affect what's "right" and "wrong". And an acknowledgement that it's possible for people to come to slightly different conclusions about what to do in a particular situation. All of that would be way better than these absolute rules- be thankful, be obedient, don't be selfish, don't be scared, etc. Maybe you think "these are movies for little kids, they have to keep things simple." Sure, okay- but here's the thing: they were NOT teaching "in most normal situations, you should do X." They were teaching it as an absolute. And even if they did give those caveats, like "usually you should X", there's still the question of how to know if you're in one of those rare exceptions where you actually shouldn't do X. Which, you would think, they would want to give some guidance on, so that naughty kids couldn't always claim they're in one of those special situations where the rules don't apply to them. And it would be different if, as I grew up in Christian culture, I received more teaching on how to evaluate a situation and know if it's one of those situations where X is a good idea. But that's not what happened. It was more of the same- be thankful, be obedient, don't be selfish, don't be scared- but dressed up with more advanced language, for the adults. 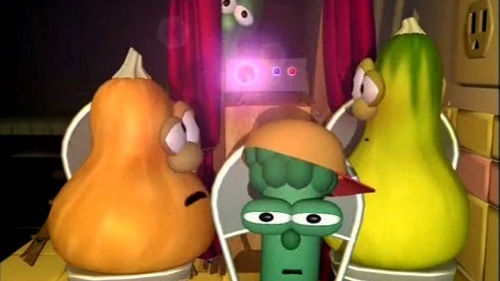 VeggieTales is fun to watch, but the morality lessons are simplified to the point of actually being bad advice. Instead of absolute rules, we should be teaching people how to make good decisions about what to do in a particular situation.